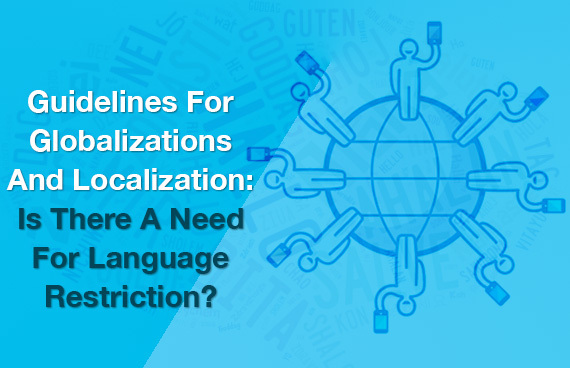 Guidelines For Globalizations And Localization: Is There A Need For Language Restriction? The whole world has become one big global village with the boom of the ever friendly World Wide Web. One can easily say that it not only has made things economically friendlier but one of its biggest advantages is that it has brought countries and more specifically cultures close to one another. Earlier one could only dream of being able to witness another country’s culture but now everything and everyone is as close as we would like them to be. It is possible to speak to a person who is miles away from you and get first hand information about their country, the culture they follow, the language they speak in their ideas, their religion, their values and most importantly with the introduction of Globalisation and Localisation we have an easier access to the goods and services of the other countries. Globalisation has impacted India in a very magnificent way as it has introduced us to the Western lifestyle of the people of the West and with that their various social structures and systems adhered to and followed by their people. One of the important aspects of Globalisation which has now become very localised in its approach is the introduction and establishment of the influence of the western education, the western clothes and the western ideas and thoughts. The concept of Globalisation has also influenced the Indians to try their hand field of business promoting a change in its sectoral economic engagement from primary sector to the tertiary and secondary and spreading among the people the importance of graduating with the very Americanised MBA degree which again is no longer confined only to the states of America but has come barging like the wind through the windows of every Indian household. Even the food that we so fondly eat is majorly the delicacies of various other continents and states and it is the effect of globalisation that we can enjoy them. Further it is important to remark that globalisation is not the increasing dependency on foreign products but the opening of new horizons by making available to the citizens a plethora of option sin every field of life to choose from making it an important aspect of our life. We often see that globalised products are used in mixture with the local products like for example; often do you see people wear an Indian cotton kurta with jeans which are an American invention. This mixture is the result of globalisation which has become localised in today’s world. Many are of the view that globalisation has in a way done damage to our own domestic cultures as people tend to pick up the cultures of other countries, but how can one be well aware if he/she is just isolated in their own cultures. Recently German was discontinued in schools in India as Sanskrit was to take it place, but where is the democracy if we don't have the right to choose. Being able to learn a new language not only helps us immensely in the world outside but also helps us to understand the culture and ways of various people around the globe. © Copyright 2015 Rephraserz Media and Communication Services.